Visit the Nostalgia Section above to see the latest photos. from Lemont Furnace, Uniontown, and Fayette County. Click on the topix.net image. The Map Is Back after being out of service for a while. Click on the picture to see a satellite photo of Lemont. Zoom in, zoom out, have fun with it. Thanks to Ron Smithburger for submitting it. Looking for a smile? Click on the logo below to learn a little about the local dialect. This web site takes a "tongue in cheek" approach to the things we are used to seeing and hearing. Visit Cool Links to visit the American Family Immigration Center at Ellis Island. There is always something of interest in Cool Links, Including the Coal and Coke Heritage Center, Fayette County Visitor's Network, Laurel Highlands Visitor's Bureau, Slovakia.org, and much more. 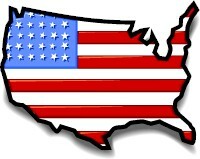 Click on the map image and you will be taken on a tou r of our beautiful country. You will need to have your speakers turned on for this 4 minute tribute, "My Beautiful America". - As a family member, your name may appear in these pages. However, you will not see your telephone number or your address unless you decide to submit it in some fashion. What you see here is a matter of public record: names, birth dates, etc. Your privacy will be guarded here. September 11, 2001 - In honor of all those who have sacrificed their lives for others. We will never forget you.